Much is known about the transcription cycle of protein-coding genes by RNAPII, which entails a fascinating and highly coordinated sequence of processes that promote nascent transcript maturation concomitant with transcription. As the nascent RNA emerges from the polymerase, it is capped on its 5′ end. Later, as the polymerase progresses through the coding region, introns are spliced from the nascent transcript. Upon transcription termination, addition of a protective polyA tail to the transcript 3′ end still occurs on chromatin. These co-transcriptional events are mediated by exquisite post-translational modifications of the RNAPII enzyme itself, which coordinate the timely recruitment of appropriate machineries at each stage of the transcription cycle. Appropriate chromatin modification of histone tails are also often coordinated by post-translational modifications of RNAPII itself, marking active promoters and their coding regions for further cycles of transcription. Regulation of RNAPII at its C-terminal domain (CTD) by phosphorylation extends beyond the changes associated with active transcription cycles. Phosphorylated RNAPII has been reported at inducible genes, before activation, e.g. heat-shock. Our group has identified a novel poised form of RNAPII at silent developmental regulator genes in mouse ES cells, which are repressed by Polycomb complexes, but become activated through early differentiation and cell commitment (Stock et al. 2007; Brookes et al. 2012). RNAPII activity is also regulated by modifications of its C-terminal domain (CTD). We have recently identified methylation of the non-canonical lysine-7 residues present at the distal section of the CTD. K7me1 and K7me2 mark active genes, but their abundance reflects less productive states of transcriptional activation (Dias et al. 2015). Two major Polycomb Repressor Complexes, PRC1 and PRC2, are important for maintaining the poised state of primed developmental regulator genes. Polycomb complexes modify histone tails; PRC2 contains Ezh2, which methylates H3K27, and PRC1 contains Ring1A and Ring1B, which monoubiquitinylate H2AK119. In 2012, we showed that Polycomb and RNAPII are found co-associated on chromatin at developmental regulator genes (Brookes et al. 2012). We used chromatin immunoprecipitation (ChIP) coupled with next generation sequencing, to map the phosphorylation state of RNAPII and Polycomb occupancy across the genome. Surprisingly, not only did we find RNAPII at developmental regulator genes under Polycomb repression, but its presence was positively correlated with the amount and occupancy of Polycomb. To characterize the extent of transcriptional activity at poised genes, which are targets of Polycomb repression, we are analyzing chromatin-bound RNAs using genome-wide approaches, and CAGE-seq data (the latter in collaboration with FANTOM5). Our unbiased genome-wide analyses of RNAPII and Polycomb occupancy also identified novel gene targets of Polycomb regulation in mouse ES cells, which were more unexpected (Brookes et al. 2012). In particular, we found a cohort of genes which are active in ES cells but whose expression is dampened by Polycomb repression. This group of genes includes many genes important in cell cycle, cancer, signaling and energy metabolism. Our current studies aim to better understand their regulation in the transition from pluripotency to differentiated cellular states. To probe for the dynamic changes in polymerase and chromatin conformation that accompany re-programming of gene expression during cell commitment, we have extended our analyses to neural stem cells and differentiated neurons (co-funded by BBSRC and MRC, UK) and to cardiac lineages (co-funded by MRC-BHF, UK). 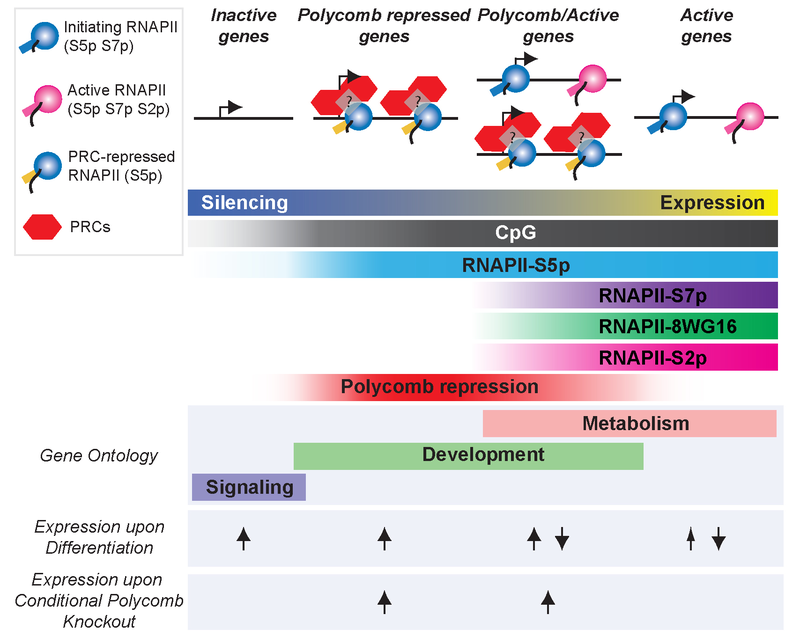 Bioinformatics analyses are ongoing to further understand how Polycomb repression acts to establish poised states of RNAPII occupancy at genes which have roles in pluripotency and differentiation. Long-range gene regulation works through chromatin looping mechanisms that bring together the promoters of genes with distant regulatory regions (e.g. enhancers; Beagrie and Pombo, 2016). During this contact, mediated by transcription factors, RNA polymerases and other chromatin associated components, the transcriptional machinery is delivered to the gene, which acts as the starting point for the synthesis of transcripts. 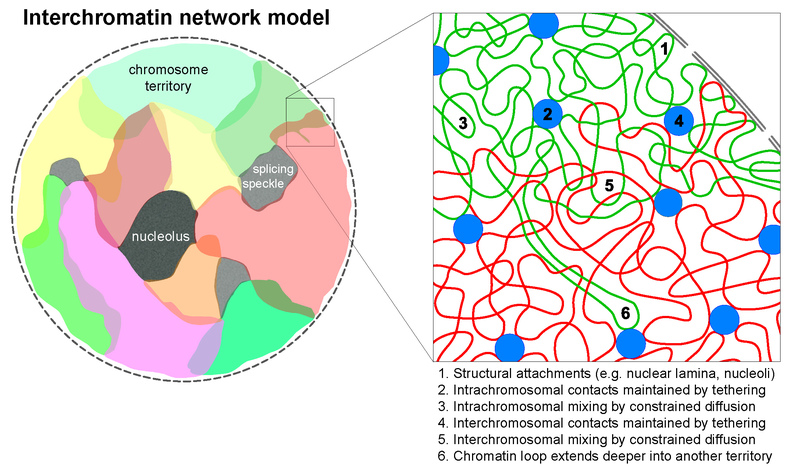 In 2006, we have proposed the Interchromatin Network model of chromosome organization which postulates that chromosome folding is driven by contacts between different genomic regions and between chromatin and nuclear landmarks, such as the nuclear lamina (Branco and Pombo, 2006, 2007; Pombo and Branco, 2007). Genes that regulate early development are often expressed at different stages of differentiation and in cell types, and are accordingly regulated through specific interactions with different regulatory regions. In addition to contacts with their respective enhancers (which can exist up to 1 Mbp from the gene promoter), genes also co-associate with other genes in 3D space. Our group has shown that Active and Polycomb-repressed genes associate, respectively, with ‘Active transcription factories’ (containing RNAPII-S5p, -S2p) and with ‘Poised transcription factories’ (containing RNAPII-S5p and Polycomb; Ferrai et al. 2010; Brookes et al. 2012), and suggested that such associations establish specific chromatin topologies that are important for silencing in the primed state, or for robust activation upon induction. We currently use polymer physics modeling to study the mechanisms underlying complex chromatin folding patterns associated with long-range regulation, and how they might be established through different chromatin epigenetic states. With Prof. Mario Nicodemi (Univ. 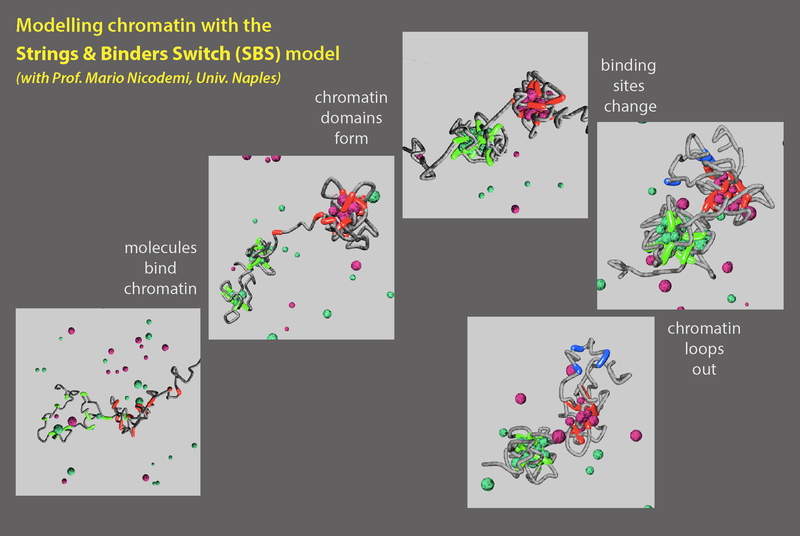 Naples, Italy), we have shown that available data on chromatin contacts, both originated by 3C approaches and fluorescence in situ hybridization (FISH), can be explained with the Strings & Binders Switch (SBS) model (Barbieri et al. 2012; Pombo & Nicodemi 2014). Our current work combines single cell imaging by cryoFISH (Branco and Pombo, 2006) with polymer modeling using the SBS model to investigate 3D chromatin folding mechanisms. For our recent reviews on these topics, check out Beagrie and Pombo (2016), Pombo and Dillon (2015) and Nicodemi and Pombo (2014).